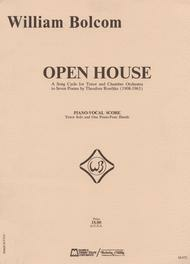 Open House (Tenor and Piano). Composed by William Bolcom. For Piano, Vocal. Vocal. Grade 3. Edward B. Marks Music #M872. Published by Edward B. Marks Music (HL.8265).Poetry by Theodore Roethke. Contents: First Meditation • Give Way Ye Gates • I Knew a Woman • Open House • The Right Thing • The Serpent • The Waking. Duration: ca. 35 minutes.